From Robert Gehl: Virgina Gov. 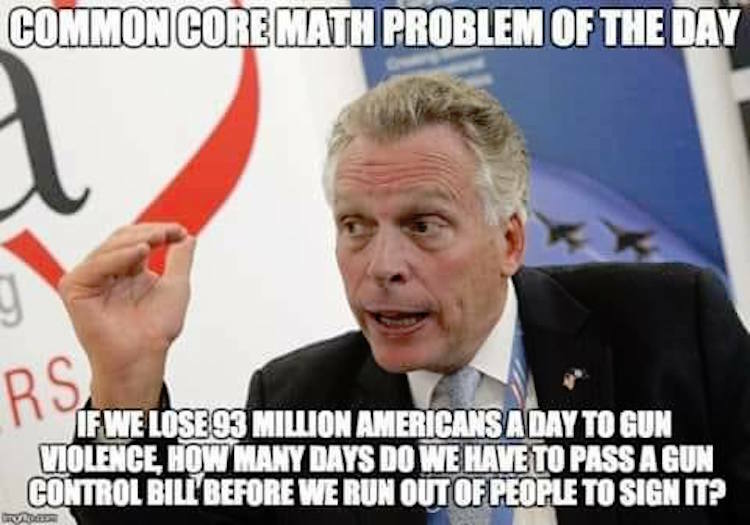 Terry McAuliffe is completely off his rocker. The leftist leader – and Hillary Clinton lackey – was one of the first to jump out in front of the cameras, standing in the blood of the victims of Wednesday morning’s shooting in Alexandria to call for more gun control laws. In the press conference, he made a gaffe that had us seriously questioning if we heard him right. McAuliffe then said “today is not the day” to bring up gun control, but – of course – he brought it up. When a reported pointed out the idiocy of his statement, he simply replied that he brings up gun control every single day. So why not politicize a mass shooting where a sitting member of Congress was shot, right, Governor? For the record, McAuliffe must mean that 93 Americans are killed by “gun violence” every day, not every year. And even that number is sketchy, because it includes suicides, accidents and other incidents. In reality, the number of Americans actually murdered with a firearm as the weapon is about 32. Early Wednesday morning, a gunman opened fire on Republican members of the Congressional baseball team at a practice field in Alexandria, using a rifle to shower the field with bullets that struck five people, including Steve Scalise (R-Louisiana), the majority whip of the House of Representatives. Two members of Mr. Scalise’s protective police detail were wounded as they exchanged gunfire with the gunman in what lawmakers described as a chaotic, terror-filled ten minutes that turned the baseball practice into an early-morning nightmare. The police said two of the five people shot were critically wounded.